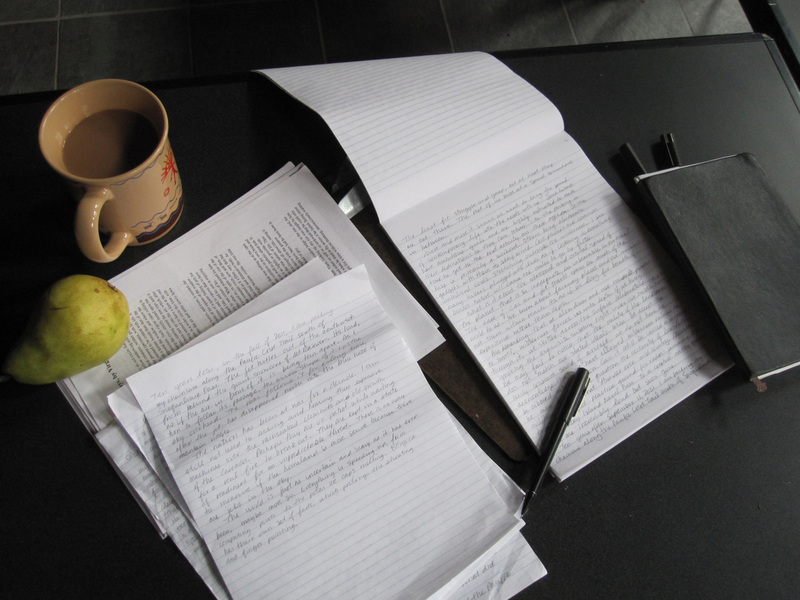 A weekend exploring essay writing at North Cascades Institute…I love this place. It’s in a beautiful setting with a thoughtfully designed campus. There are always interesting classmates and instructors to talk with. The learning takes place outdoors as well as inside. And the food is excellent! What could be better than intent focus on creative work, then coming in to find a hot supper? Lyanda Lynn Haupt was the able facilitator who led us through writing exercises and conversations about the writing life. I really look forward to making my way through her book Crow Planet to observe how she practices the art of the essay. When the workshop ended yesterday afternoon, I drove east over Washington Pass and stopped to look at the mountains. Subalpine larches dot the slopes with gold, and there is a dusting of new snow. The entire Pacific Northwest is swathed in clouds, and there is a tentative unsettled feel to the weather. The closest place to camp is along Early Winters Creek, and that’s where I stayed. It takes no time at all to set up the tent. 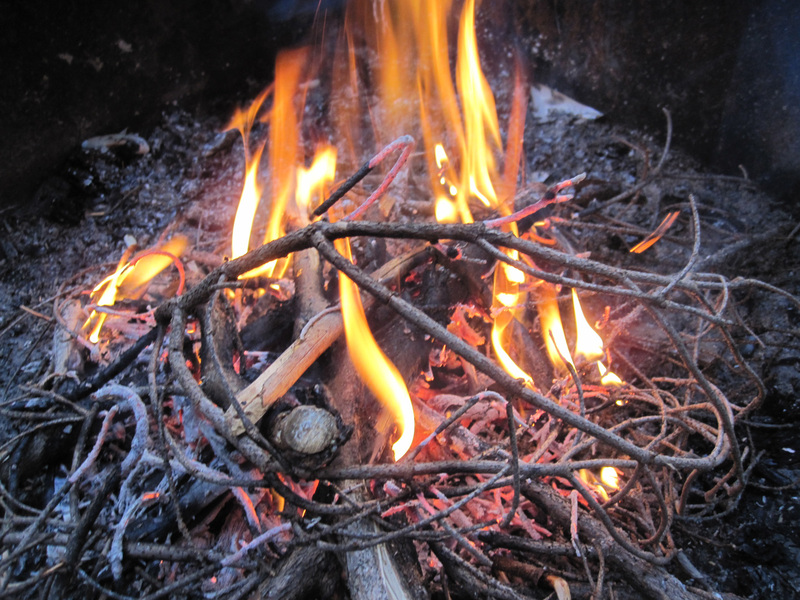 As a rain shower passed, I gathered a bundle of sticks and made a fire. I rarely make fires, but this turned out to be the perfect thing to do. Tired of reading and writing and talking, I was ready to work with my hands, then just sit. It took a little bit of paper, two matches, some blowing and patience, but before long I had a companionable fire crackling away. The spruce twigs and branches had been rained on, but were still dry inside. While I simmered some food on the camp stove and ate, the flames flickered and consumed their fuel. The colors kept me entertained, and my knees were warmed. By the time the last sticks were sinking into a pile of feathery ash, the sky was dark and I was on my way to bed. Got up this morning to write. 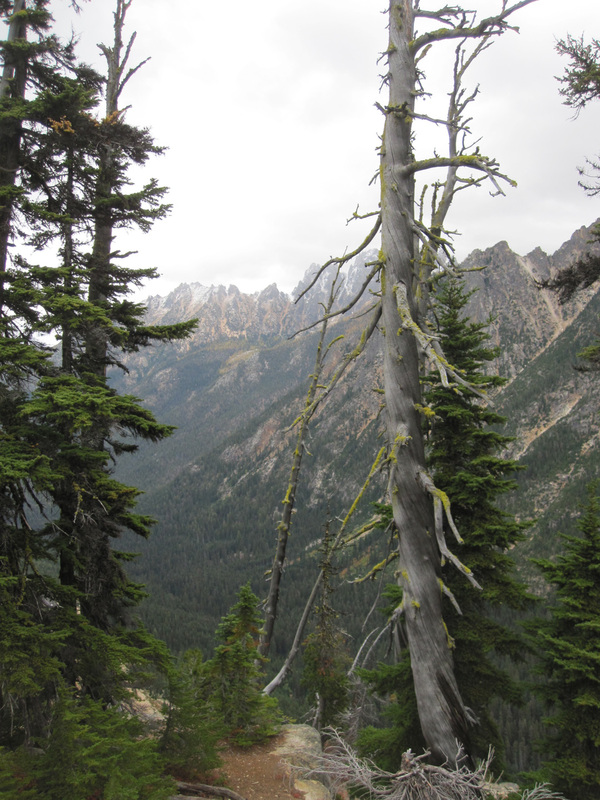 I had planned a walk north on the PCT to Cutthroat Pass, but the air had the feel of rain. Damp has settled into my bones and a couple of old injuries are aching. The shelter of home tugged at me and I let it settle me into the seat of the truck to drive to the rhythm of windshield wipers. Journeys come full circle. In the fall, it’s good to know there’s a good roof and couple of cats waiting.